The first generation of Chevrolet small-block engines began with the 1955 Chevrolet 265 cubic inch V8 offered in the Corvette and Bel Air. That original Chevy small-block engine has become retroactively referred to as the Generation I small-block, as it is distinctly different from subsequent Generation II LT, Generation III/IV LS, and the most current Generation V LT/EcoTec3 engines. 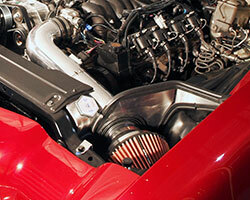 The third generation Chevrolet small block LS engine was first introduced for 1997 in the first year C5 Corvette. Although, the LS1 engine shared little in common with its predecessors, both the Gen III and subsequent Gen IV LS engine has become an increasingly popular option for muscle car enthusiasts looking for a lighter, more powerful, and more modern power plant. It almost goes without saying that a Gen III/IV LS engine swap into a classic mid-1960’s to early 1970’s Chevrolet muscle car or pickup truck is going to require some amount of custom fabrication and adaptation. One obstacle that will need to be overcome for an LS engine swap is that in the 1960’s, up through the 1980’s, cars and trucks were carbureted and the air cleaner assembly sat directly on top of the engine. This means that figuring out how to supply a modern fuel-injected LS engine with plenty of cool airflow is going to be a little trickier once it’s dropped into a car without the proper provisions. Luckily Spectre Performance has an easy solution for classic Chevrolet muscle car owners looking for modern LS engine power. Since 1983 Spectre Performance has designed and offered unique, innovative, parts and components to fuel your car or truck obsession. Whether your fixation happens to be a classic Chevrolet muscle car or pickup truck, Spectre will help fuel your passion for performance. Spectre Performance has designed an air intake system for LS engine swaps on Chevy Biscayne, Impala, Caprice, Camaro, Chevelle and Nova models. These air intake systems are available in different configurations depending on the car, engine and mass airflow sensor setup being used. Each Spectre Performance LS swap air intake system features polished aluminum air intake tubes, red, blue, black, or white Spectre High Performance Racing (HPR) reusable air filters, and a heat shield designed for each vehicle’s engine bay for an excellent fit and function. In addition to the most popular classic Chevrolet models listed above, Spectre Performance offers application specific Air Filter Heat Shields for 1963-1964 Chevy Impala, 1968-1974 Chevy Nova, 1967-1972 Chevy C-Series pickup, and 1973-1981 Chevy C-Series pickup models. These application specific air filter heat shields will aid anyone trying to build a custom LS swap intake system for these Impala, Nova, and C-Series models. Browse all Spectre automotive products by category at SpectrePerformance.com. While you are there use the Products by Vehicle Search to find Spectre performance products specifically made for your vehicle. To find a Spectre dealer near you use the Spectre Dealer Locator.